Posted by Steve on September 24, 2017 . Leave a comment. I love numbers! More correctly, I suppose, I should say that I love the fact we can always learn something useful from numbers because they can be relied upon to tell the truth if we let them. But when things don’t make sense – when the numbers don’t “add up” – it’s time to start asking why! This all began when recent events prompted me to revisit a topic I touched upon several years ago in The (High?) 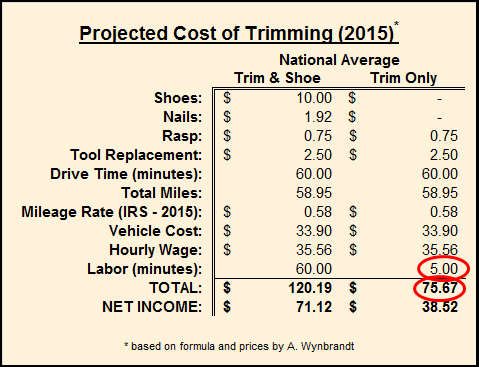 Cost of Hoof Care: the huge disparity between what farriers charge to shoe a horse, and what farriers (and, consequently, horse owners) perceive to be the value of a properly-done trim. Part of the impetus comes from a client in the process of opening a small full-service horse retirement facility who wanted to offer her boarders another hoof-care option; problem was, the farrier she contacted wouldn’t come out just to trim a single horse! 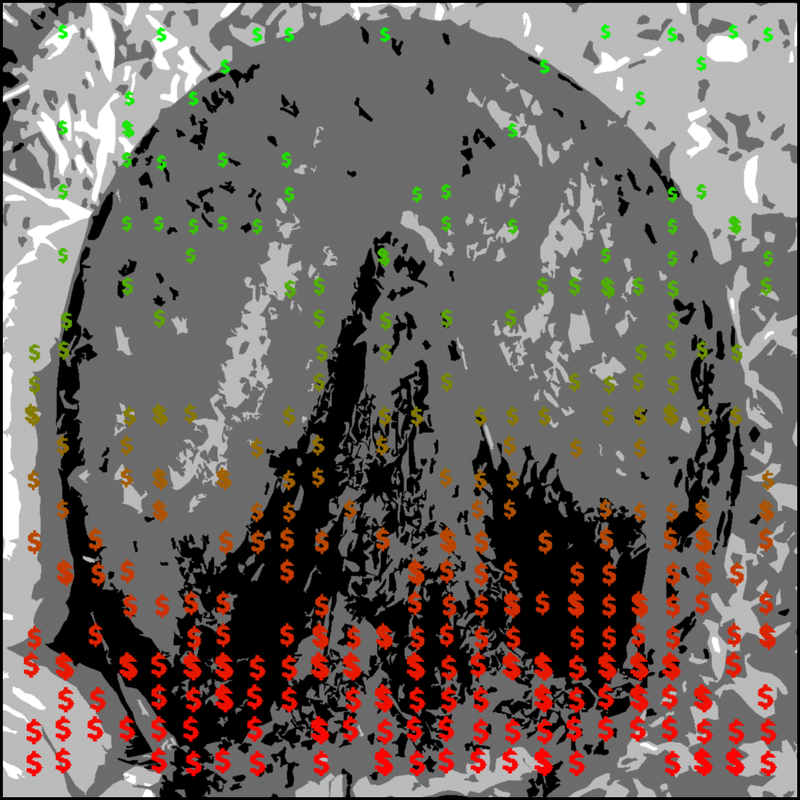 So I decided to do a little investigating into pricing strategies, looking first at data for shoeing versus trimming costs. 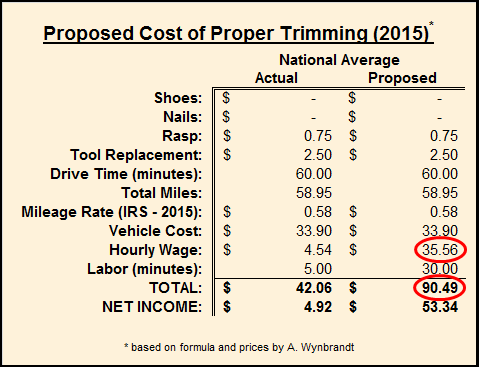 According to a survey conducted by The American Farriers Journal of its readers last year, the average nationwide price for trimming four hooves and applying four keg (machine-made) shoes by a full-time farrier was $131.46, while, interestingly, the same work performed by a part-time farrier averaged $94.49. Trimming and resetting those same shoes by a full-time farrier averaged $125.52. 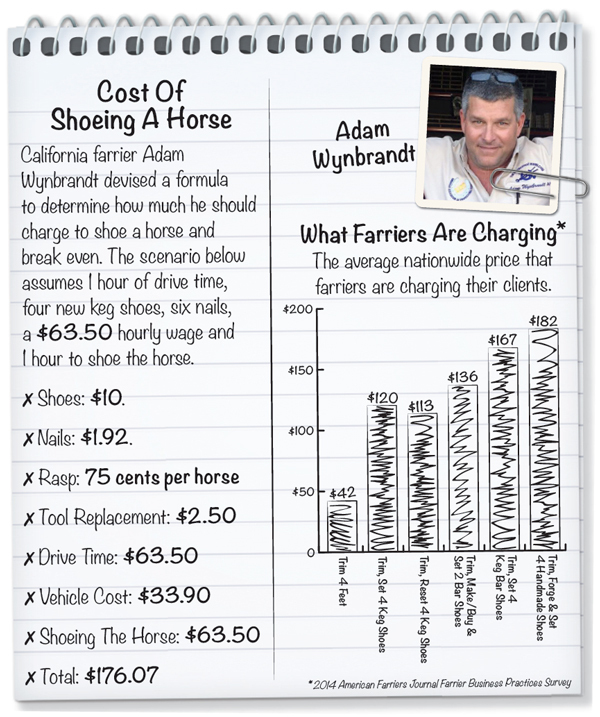 To trim a horse, full-time farriers charged an average of $43.13, while part-timers averaged $37.22. They’re farriers, not hoof trimmers. I often read this journal in the university’s library – mostly between 1997 and 2014 – but stopped reading it due in large part to the obvious disdain for so-called “barefoot” hoof care and its providers that permeates the magazine’s articles and letters. About 70% of full-time farriers went to a farrier school, for an average of 12 weeks, according to this same survey. So to obtain the national average, we have to reduce the Hourly Wage to $35.56 per hour. Note that nothing else has changed, because everything else on the list is essentially independent of location. I’ve left the Rasp and Tool Replacement amounts the same, although one might argue that the tools required for trimming-only are fewer than those needed for shoeing. However, the tools that wear and need to be regularly replaced – the hoof knife and nippers – are the same for both situations. 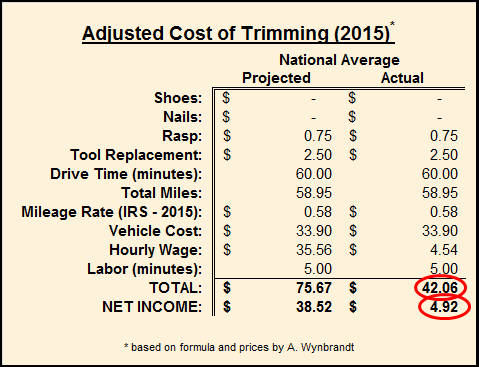 I’ve calculated the Total Miles by dividing the Vehicle Cost by the 2015 IRS mileage allowance of $.575/mile. Wait! So in the above scenario, collecting the national average cost of $42.06 for trimming a horse entails driving for an hour and wrestling with a horse for 5 minutes (ha! ), but, ultimately, pocketing only $4.92? I’d do far better at MacDonald’s, and (probably) wouldn’t even have to risk my life! That would explain why farriers don’t want to drive to a barn to trim a single horse, but what it doesn’t explain is why farriers themselves believe that (only) trimming a horse is so much less valuable and/or important than trimming and shoeing. 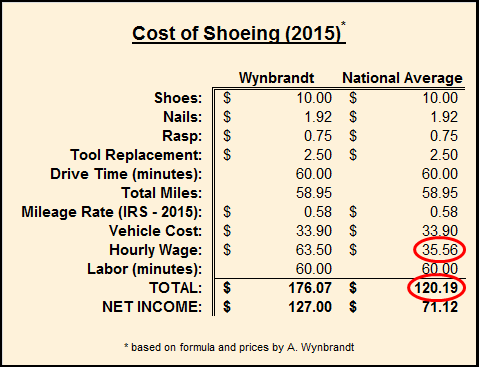 After all, the cost differences come down to shoes, nails, and the time required for the actual work, with the “hardware” costs representing a rather small portion of the total picture (contrary to what many horse owners are led to believe, by the way!). So why the huge disparity; why not charge the $75.67 common sense and their own formula prescribe? One possible answer may be hinted at by an examination of the course of study undertaken during that 12 weeks of farrier school by some 70% of full-time farriers: At what many consider to be the best farrier school in the U.S., anatomy, conformation, and biomechanics appear to comprise only about 3% of the total course content of their Advanced Horseshoeing and Blacksmithing program, with no study of trimming apart from shoeing even mentioned on their web page. And yet, I daresay not a single instructor at this or any other horseshoeing school would argue that the best handmade shoe in the world could possibly make a correctly-balanced hoof when placed on top of an unbalanced trim! As an interesting contrast, I know that in the Liberated Horsemanship hoof trimming training program, for example, the introductory clinic alone consists of approximately 40 hours of trimming theory along with directly-related topics such as biomechanics and nutrition, and practice. From there, students go on to study individually with field instructors for another minimum of 24 hours, and then typically spend another year or more trimming their own client horses to gain experience before final assessment for certification. When it comes to understanding the hows and whys of proper trimming, that’s a pretty marked difference in education and training as compared to the horseshoeing school’s 12-week advanced training program. And when it comes to the actual process of proper trimming, it also makes it extremely difficult for horse owners to compare skill sets between those who have gone to farrier school and those who have studied in one of the (admittedly very few) dedicated natural trimming training organizations. More recently, the problem has been further compounded by the ever-growing number of “weekend-style” trimming workshops that allege to teach proper trimming in a scant few hours. But, back to the numbers! So, one might argue that perhaps farriers devalue trimming as much as they do simply because it was only a small part of their studies, and instead see their value as being more directly in the area in which they received the overwhelming majority of their education – making, modifying, and applying, horseshoes. Likewise, I might also argue that the work of those hoof care providers who have gained their knowledge about proper trimming techniques through a similarly-in-depth course of study should be worth just as much (minus the hardware costs, of course!) as the farriers’, especially when a more realistic figure for performing a proper trim is considered. So, realistically, the hopefully-well-trained hoof care provider working for far less than minimum wage still only pockets $4.92 for his/her hour-and-a-half time commitment! So, what do you think? Is the expertise of your hoof care provider worth it? Would you expect to pay less for a doctor’s visit for a cold rather than a case of bronchitis? Doubtful, because you’re not paying “by the disease;” you’re paying an expert in his/her field for the best diagnosis and treatment possible, regardless of the disease. On the other hand, you would (and should) probably balk at paying the same amount to a dentist for his/her diagnostic abilities with regard to your cold, because there are significant differences in their educations. In fact, I suspect it’s highly unlikely you’d even consider going to the dentist about your cold! So if the best and healthiest option for your horse turns out to be “only” a trim, then it seems logical that it be carried out by a properly-trained hoof care provider. And if the cost of shoes and nails is really just a few dollars, why would/should you expect to pay the trimmer significantly less than the farrier? Share the post "What Are You Really Paying For?"